📅 December 2018 April 9, 2019 by Bruno B. 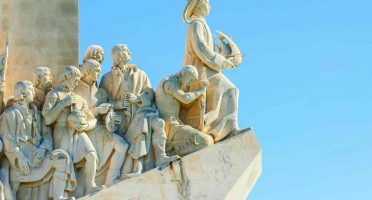 Struggling with your Japan itinerary? I feel you! If it’s your first time to Japan, chances are you’re feeling overwhelmed with where to go. Here is a simple 2-week Japan itinerary to help plan your trip to this fascinating country! Japan was definitely one of the most special and enriching trips I’ve ever made. I indulged in the delicious and rich food. Fell in love with their fascinating but also wacky culture. Hiked mountains, relaxed in onsens, and did my fair share of temple-hopping. I learned a ton about the way Japanese live, act and think and honestly, can’t wait to be back! Now it’s your time to have these experiences! This Japan itinerary is based on my first trip to the country. I actually stayed for 17 days, as I added extra time to meet friends there. 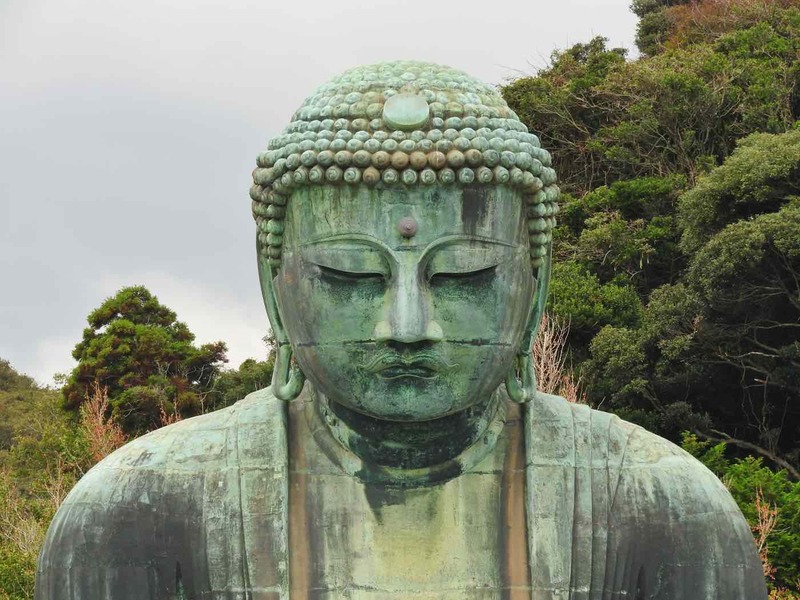 This Japan itinerary starts in Tokyo with a day trip to Kamakura. Then it’s headed up north to the mountains to visit Takayama and Shirakawago. Later, arrives Kyoto before venturing west to Miyajima and Hiroshima. 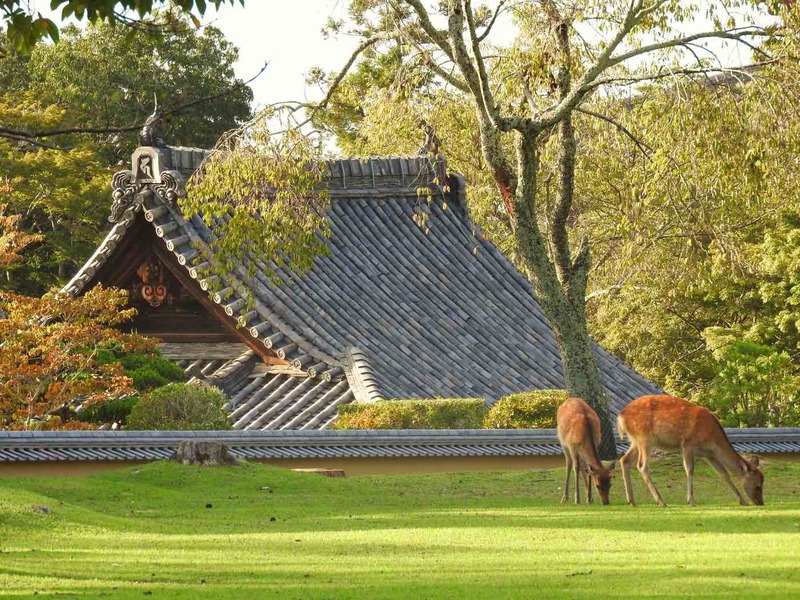 Finally, it ends in Osaka with a day trip to magical Nara. To make things easier, I’ve put all these places on this custom map I used during my trip. It also contains restaurants, main sights and even a list of wacky stores and places to visit. Who is this itinerary for? This itinerary is tailored for first-time travelers to Japan. I tried to achieve not only a good overview of the country but also a balance between urban vs countryside, between big city vs village. That said, obviously tweak the itinerary to favor more time in the places that resonate with you the most. Will I see everything in Japan with this itinerary? No. Ditch any FOMO. It’s impossible to see everything in Japan in such a short amount of time. Is it jam-packed or more relaxed? I wouldn’t say this a rally course, but it’s not entirely a breeze. There are some day trips and there are some stops where you’d only be staying 1 night. If you’re traveling with kids or want a more relaxed trip, consider tweaking it. Where did you arrive and leave Japan? I arrived in Tokyo (Narita airport) and got my flight back from Osaka. I traveled mostly by train, using a JR Pass. In the end, I did some math and figured it save me some – not much – money but mostly it saved me time. It’s very convenient not to have to buy individual tickets every time. I’ve also used buses to get to Shirakawa-go, ferry to Miyajima and subway/local trains inside the cities. How much does a trip like this cost? Make sure you check my budget breakdown further down the post. This Japan itinerary will take you to some magical places. 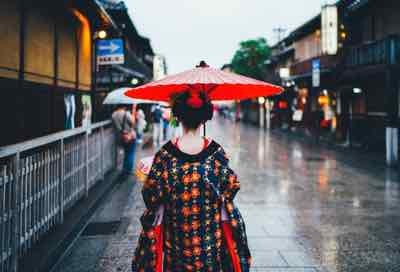 When is the best time to go to Japan? Every season of the year brings out a new kind of beauty in Japanese landscapes and traditions. Note the weather varies a lot depending on the region you’re visiting. Overall, spring and fall months, when temperatures are milder and there is less rainfall, are the best times of the year to visit Japan. Spring (March to May) – Magical time to visit. However prices skyrocket close to hanami (cherry blossom) season (see below). Summer (June to August) – Weather can get a little crazy with the peak of typhoon season and high temperatures. Hiking season in Mount Fuji. Fall (September to November) – Great chance of seeing the vibrant color spectrum of autumn leaves. Mild temperatures. Winter (December to February) – The coolest months bring less visitors to Japan, but prices are also considerably cheaper. Best time to visit the snow monkeys in Jigokudani and to hit the slopes in snow sports. As a natural event, there are no fixed dates when does hanami takes place each year. Generally, the more south you are geographically in Japan, the earlier the blossoms open. In big cities like Osaka, Kyoto and Kyoto cherry blossom happen in early April. But it can go as early as January in the southern islands of Okinawa and as late as May in northern Hokkaido. Japanese people are healthily obsessed with cherry blossom season and is deeply rooted in their culture and nationwide traditions. It represents the ephemerality, fragility of life: so beautiful but so short at the same time. Problem is: everyone is traveling to and in Japan during this time of the year. Prices will be inflated so make sure you book your trip with extra time in advance. Arriving Tokyo feels a bit like getting yourself plugged in to electric current. First stop: crazy and energetic Tokyo! No matter what other big cities you’ve visited – London, Dubai or even New York City – nothing can really prepare you for Tokyo. With a suburban area of over 35M people and home to the largest train stations in the world, I felt tiny. Extremely tiny. The great thing about Tokyo is that is extremely efficient to get around. 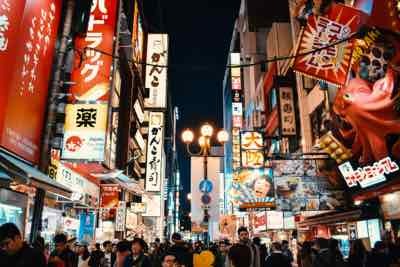 Once you start going with the same flow of locals, it’s very easy to go from the massive electronic department stores of Akihabara to the vibrant neon district in Shinjuku. Plan at least 3/4 full days to have the chance to visit the different sides of Tokyo. You can easily spend a whole month in Tokyo without getting bored. Or you can just feel urban anxiety and ready to leave after 2 days. That’s the thing about Japanese cities – they are INTENSE, up to you to decide if you like or not. For a first-timer, make sure you go to Senso-ji Temple complex. Temples are more impressive elsewhere in Japan, but this is a great first taste and the Asakusa neighborhood turned out to be one of my favorites in Tokyo! Quite frankly, Shibuya – the “Japanese Times Square”, whatever that means – intersection was slightly underwhelming to me but Shinjuku district blew my mind. It was in Shinjuku, my very first night in Tokyo, that I realized one can get sucked into the wackiness of Japanese culture pretty easily. Suddenly, I was inside a vortex of delicious ramen, cartoons everywhere, deafening music, giant skyscrapers, and neon lights of all colors. Got to admit I loved it. Senso-ji – Suddenly, a wave of old traditions immerses the concrete jungle of Tokyo. Take some time to find your luck by drawing omikuji. Shibuya crossing – Iconic but slightly underwhelming to me. Go to the nearby Starbucks for the best view (you’ll need to order something). Omoide Yokocho – Alley specializing in (really) tiny yakitori restaurants. Say osusume to get chef’s recommendations. 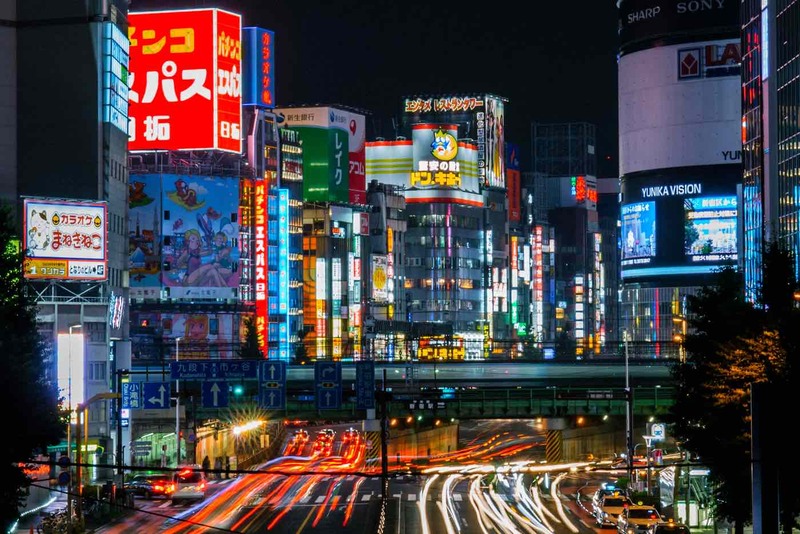 Shinjuku – The beating heart of Tokyo with thousands of shops, restaurants, bars and arcades to get lost in. Meiji Jingu Shrine – Beautiful temple in the middle of a park halfway between Shibuya and Shinjuku. Tokyo Government Building – No need to queue up in Tokyo Skytree for the best views of the city. Head straight to the 45th floor, no entry fee! Harajuku – The epicenter of the kawaii culture. Lots of animal cafés, even though there are strong reasons to avoid them. TeamLab Borderless – One of the most fantastic modern art museums (¥3200 entry fee) I’ve been. Huge digital exhibits – think LEDs and projections – in a variety of scenes. Neat Instagram material – check this out! Basically anywhere close to the circular JR Yamamote Line is a good bet. You can get to any area of the city efficiently. 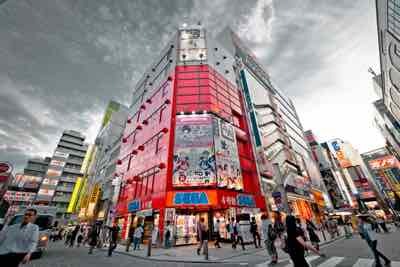 Shinjuku and Shibuya are popular areas to stay in, with a lot to see, eat and do but can also be the most expensive. Ginza and Tokyo Station are extremely convenient transport-wise but lack the fun factor in my opinion. Check out this pre-filtered list of the highest-rated places to stay in Shinjuku area in Tokyo. Looking for an experience straight out of a sci-fi movie. This is it. I stayed in Shin-Okubo area, one stop north from Shinjuku on the JR Yamamote Line. Close enough to everything, but felt good coming back home in a quieter – for Tokyo standards – part of the city. 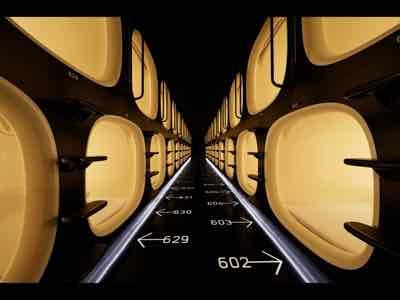 In this area, I recommend staying in the neo-futuristic capsule hotel Nine Hours or the charming Oyado Cocochi. 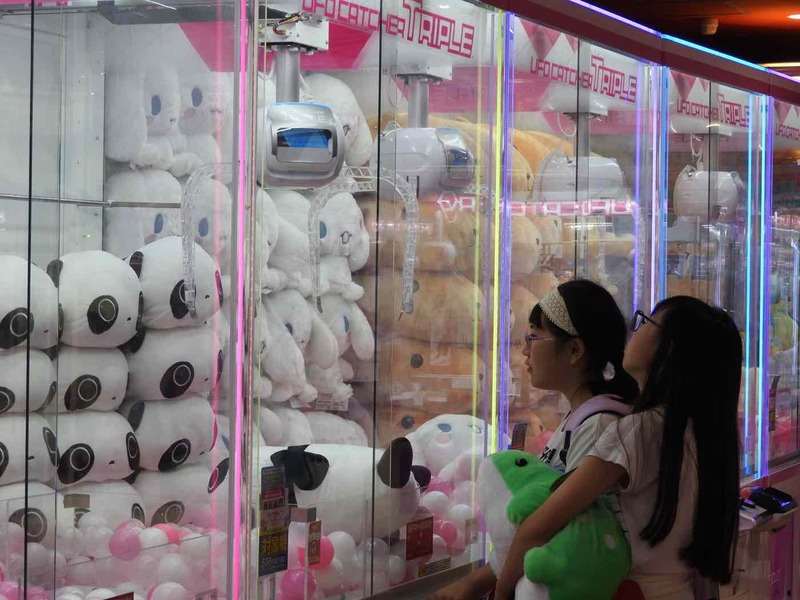 Don’t leave Tokyo without playing arcade games…because Japan. Tokyo is a true paradise for foodies with thousands of great restaurants serving whatever you’re ready to try, from low-cost ramen places to 5-star Michelin restaurants. Uobei Shibuya – Sushi delivered to your seat in cute little bullet trains. Ridiculously cheap. Standing Sushi Bar – order your sushi pieces directly to the chefs. Incredible experience and a cheaper alternative to Jiro’s restaurant, the most expensive in the world. Coco Ichibanya – recommended to me by a local. Definitely a delicious and unique curry, but gotta say y tummy wasn’t a big fan. Ichiran – Order from a ticketing machine, get served on booths without seeing the chef or waiters. Slightly disturbing experience, but hey, they nailed on what it matters the most: delicious hakata ramen. Tsunahachi – Great place to try tempura in Tokyo. 7/11, FamilyMart or Lawson – Sounds weird but egg salad sandwiches and/or pancakes with maple syrup/butter inside these convenience stores are surprisingly amazing value. These tips are bound to give you extra peace of mind on your travels. 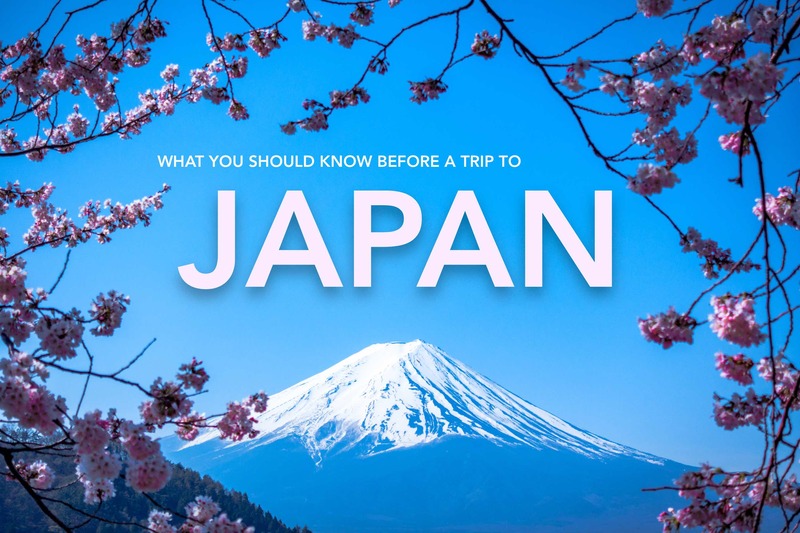 34 tips to help you make the best out of your Japan trip! This guy survived numerous earthquakes, fires and floods. RESPECT. Out of all the day trips you can do from Tokyo, Kamakura is the closest and more convenient to get to: just a short 35-min trip by train. If you don’t want to spent too much time planning and want a small getaway from the city madness, Kamakura is a nice and pleasant option. There are over 100 small temples and shrines in this area but the highlight of this town is definitely Kōtoku-in. This monumental bronze Buddha statue is reachable via a 20-min walk or a short bike or bus ride (IC cards accepted!) from Kamakura train station. You can even enter inside the statue for a small 20¥ fee. Worth it, considering “I’ve been inside a Buddha” could be a good icebreaker at parties. Hase-dera (300¥ entry fee) temple and garden complex is a great place for a stroll exploring caves, Buddha statues perfectly mashed with beautiful architecture. I’ve missed other temples and the entire downtown Kamakura and the busy Homachi street and decided to walk all the way to the coast instead, through the cute little streets, local railways, and beaches. There are many more options for temple hopping around though. Hase-dera – no one mixes architecture with nature as well as Japanese and this is just another proof. 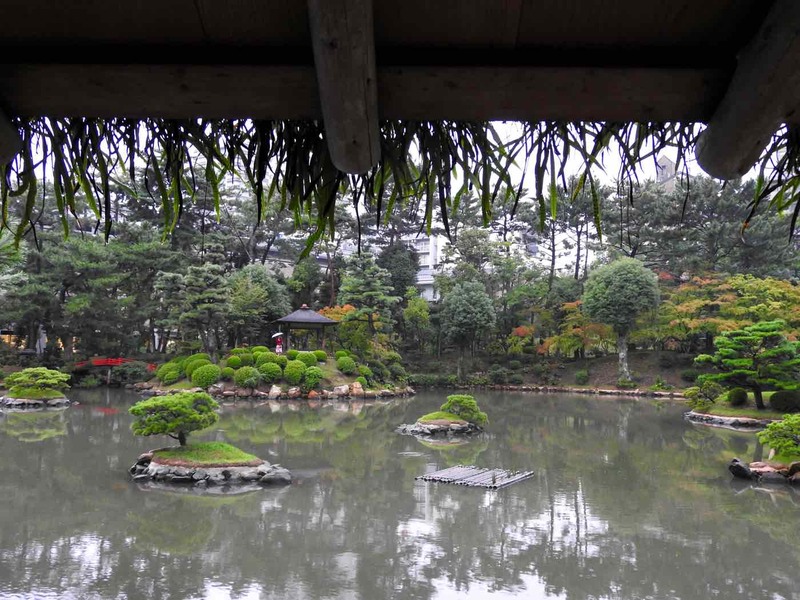 Hokokuji – a bamboo garden with a café inside awaits. Engakuji – popular for autumn leaves viewing! Time for the first bullet train ride! Shinkansen trains from Tokyo to Kanazawa (duration 2h30) depart from both Tokyo Station and Shinjuku. Grab a bento box or sushi tray from one of the stores. Don’t get late though – these trains leave BY THE SECOND and don’t wait for anyone. Like everything else in life, we got to pick our battles. So I decided to skip exploring Kanazawa entirely and used it only as a quick night stop before getting to Shirakawa-go and Takayama the following day. If you have some time in Kanazawa, definitely head to Kenroku-en garden, one of the 3 Great Gardens in Japan and to the Nagamachi Samurai district, albeit I’ve heard Takayama’s old town is more impressive. Straight out from Lord of the Rings. Do you know these tacky white postcards we used to send in Christmas with a hobbit village covered in snow? I’m pretty sure they’ve inspired in Shirakawa-go. This tiny traditional Japanese village located in remote mountains is famous for its 100+ houses built to withstand rough winters and big layers of snow. This architectural style is known as gasshō-zukuri and means “hands in prayer”. This place is beautiful at any time of the year and is a UNESCO World Heritage site since 1995. Not gonna lie – there isn’t much around “to do” here. And that’s fine. It’s good enough to just walk around the village for a few hours. See the rice fields, the Shogawa river bridge, and walk all the way up to the viewpoint with a view that you’ll surely remember for years to come. 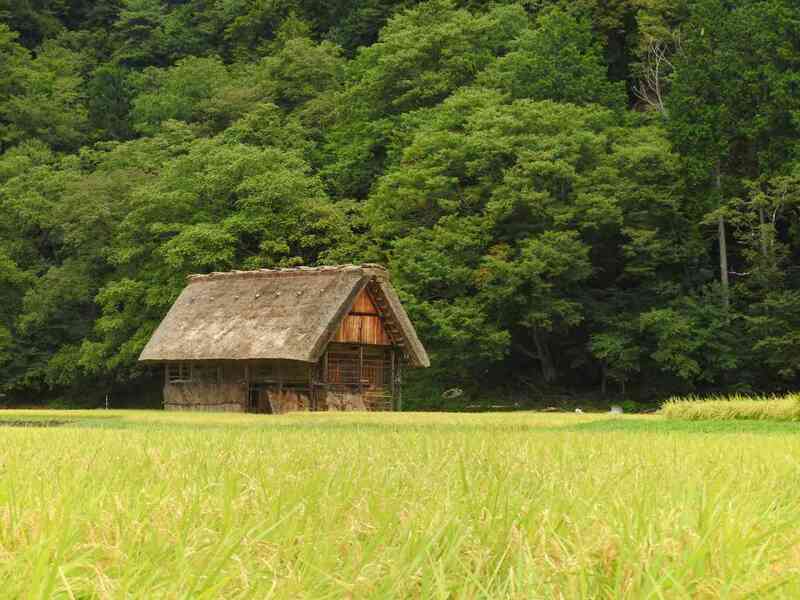 If you want to visit Shirakawa-go, study your itinerary beforehand. Staying for the night in one of the farmhouses might be a bit too boring for some and buying a return trip from Takayama is not very efficient in terms of logistics. See an alternative below. The easiest way to get to Shirakawa-go is by bus from either Takayama or Kanazawa. So coming from Tokyo, I took the late evening Shinkansen to Kanazawa and stayed there for the night. On the following morning, I hopped on the Nohi bus to Shirakawa-go and left the luggage at the bus station and visited the village. If there aren’t enough coin lockers, you can leave it with the staff. Later in the afternoon, picked it up again and got on the bus to Takayama. Easy peasy! I recommend to buy your tickets in advance online – you’ll need two separate tickets for each leg of the journey. If you can’t be bothered about your luggage, you can send it directly to your following hotel via a luggage forwarding service. In the heart of Gifu’s mountain region, Takayama is a sneak peek into the past. 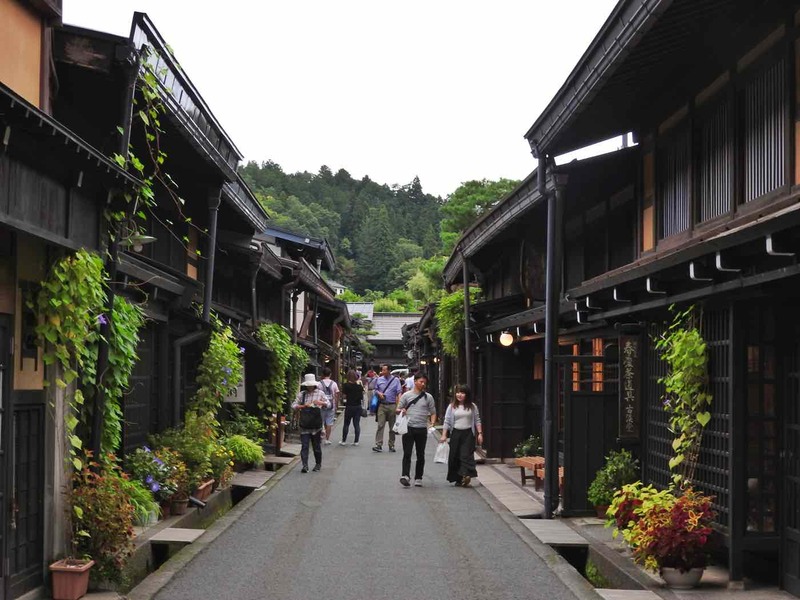 The black wooden merchant houses in downtown are extremely well-preserved and date back to the Edo Period (when Japan was essentially isolated from the rest of the world). Adding Takayama to your itinerary is giving yourself a chill pill. The pace of life here is very different than big cities and it’s a great opportunity to see a glimpse of a more authentic and rural Japan. And to stay in a traditional ryokan! The highlight of Takayama is definitely the well preserved old town, a series of streets with 17th-century houses. Today these are mostly shops and restaurants and trust me: a fully black street is quite a unique sight! Rent a bike and go to the Hida Folk Village. This open-air museum is filled with traditional wooden houses and huts that were brought over from elsewhere in the Hida mountain region. Feels like a remote village, smells like an open forest, but it’s, in fact, a museum. Oh, and of course, the food. The Morning Street Market, held daily on the riverside until noon sells not only arts and crafts but local foods and snacks worth to try. And don’t leave Takayama without trying the local Hida beef. The meal I had in Kyoya, consisting of Hida beef with mountain vegetables, in a delicious miso sauce, was absolutely delicious! 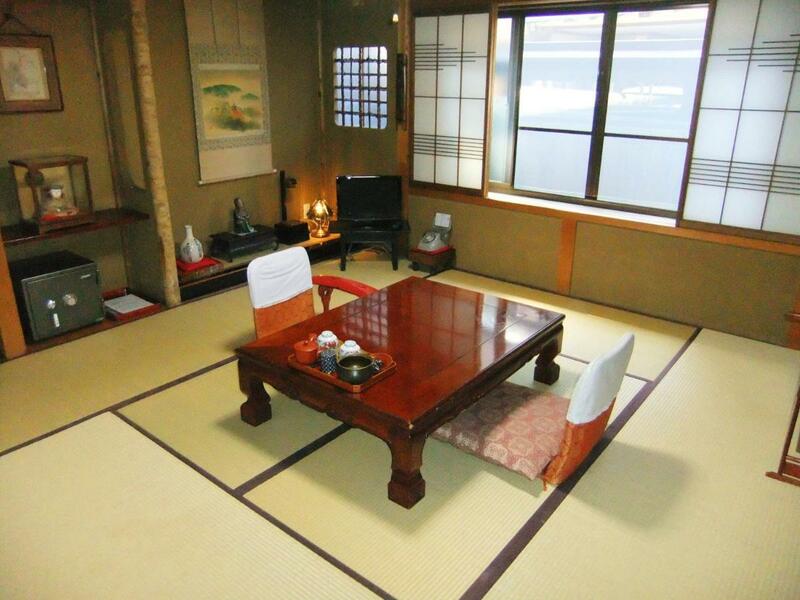 Ryokans, authentic Japanese guesthouses, can be very expensive, but they are a must-do in Japan. And if you have to pick a place on this itinerary to do it, go for Takayama. Family-owned Sumiyoshi Ryokan was by far the best place I’ve stayed on my whole trip. The best compliment I can give is that we were treated like true family members. They’ll dress you in a traditional kimono, give you dinner and breakfast inside your room. There’s also free access to a private onsen that is a great idea after a day of walking. Just a 2-min walk from Takayama’s sunday street market and the old town area. Every single one of these torii gates was donated by the community which makes this place even more special. Now, Kyoto. Maybe it was all those dreamy Instagram posts with temples, forests, and cherry blossom trees, but Kyoto surprised me by being a much bigger metropolis than I anticipated. If first-time travelers to Japan have to visit only place in the country, this is it. The capital of Honshu is a showcase of everything Japan has to offer, from imperial palaces and Buddhist temples to lush forests and traditional geisha performances. Plan at the very least 3 full days in Kyoto to have the chance to take it all in. There is no shortage of places to visit and mesmerize in Kyoto. 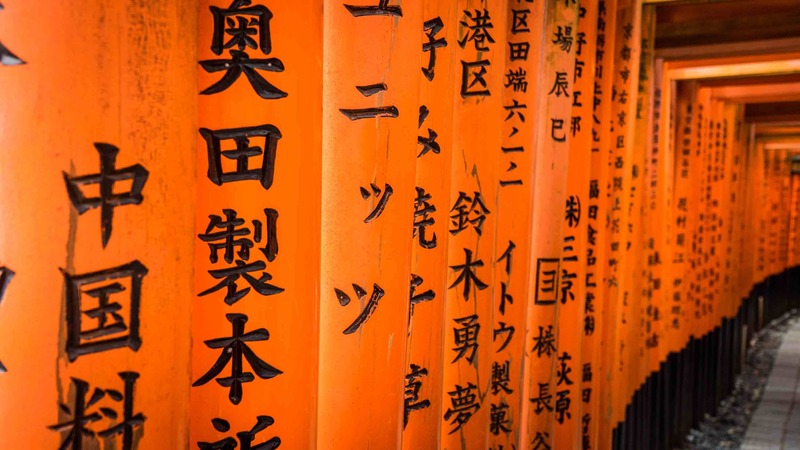 My favorite experience was Fushimi Inari, a set of over 10,000 Shinto shrines that lead the way to the top of a sacred mountain. It’s a special place beaming a special kind of energy in the air so I recommend do it as early as possible to skip crowds. By 9am, the path starts to get impossibly busy and the experience starts to get more stressful than relaxing. Same with Arashiyama Bamboo Grove. The pathways that go through this natural bamboo forest are incredibly scenic and camera-friendly but herds of tourists in front of you can quickly take away the beauty of the place. Come very early – you don’t want to ruin the cool breeze and chirping of birds. Other highlights in Kyoto include (LOTS OF) temples, Kiyomizu-dera and Kinkaju-in being the most iconic. I also definitely recommend a visit to Gion, the historic geisha neighborhood, and to the main market in town: Nishiki Market. It’s a great chance to indulge in into unique Japanese delicacies. 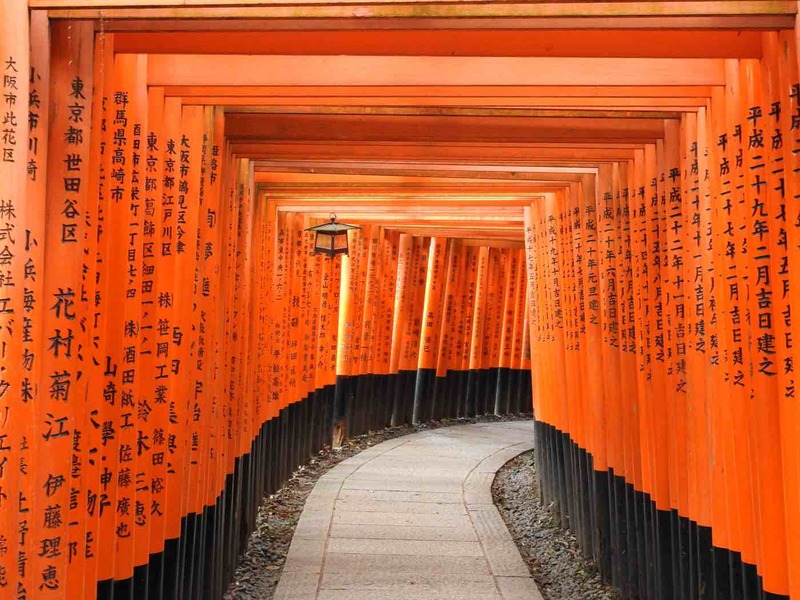 Fushimi Inari Taisha – The more you go up the mountain, the less crowded it will be and the more special your experience. Arriving before 9am makes a huge difference. 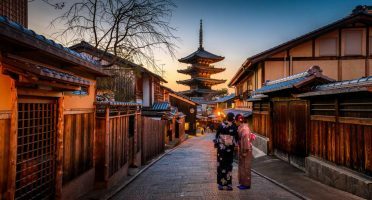 Gion – The iconic geisha district. Now, you’ll likely see tourists dressed up in kimonos, but real-life geishas are very hard to spot. They mysteriously appear around dusk on the short path from their taxi to their performance venues. Overall they don’t like to be disturbed or photographed, respect that! Arashiyama Bamboo Forest – The pathway is shorter than I expected (only about 10-15 min), but this a delight to all the senses. Come as early as possible and bring a wide-angle lens camera, if possible. Kinkaju-in (Golden Pavillion) (¥400 entry fee) – Temple covered in freaking GOLD LEAF. It’s stunning from every angle or time of the year. In between the few moments the sun peeked through the clouds, the whole structure shined beautifully. Kiyomizu-dera – You’ll need a significant walk uphill to get there but the view overlooking Kyoto’s valley is stunning and the bright orange architecture is quite a statement. 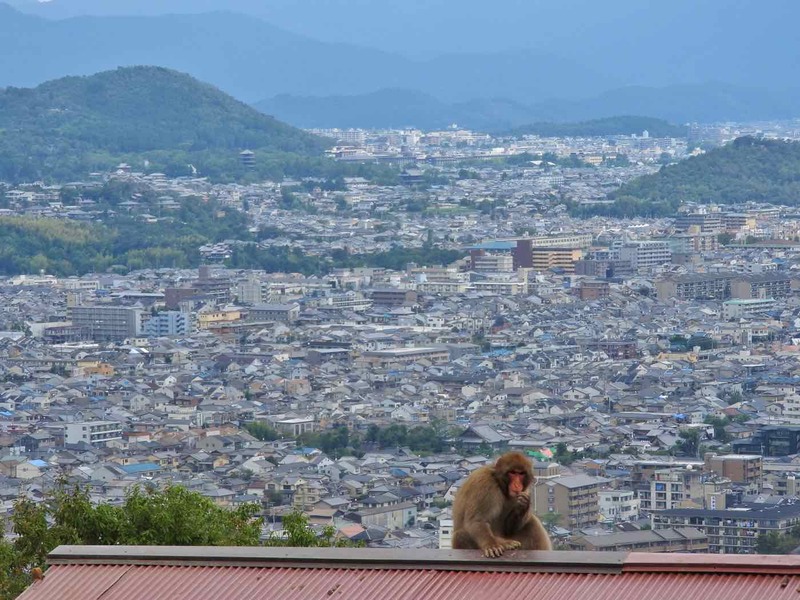 Arashiyama Monkey Park (¥550 entry fee) – After a 20-min uphill walk you’ll be rewarded with a park with dozens of monkeys – yes, adorable babies included – and open views over Kyoto. Nishiki Market – In the heart of Kyoto’s downtown, this massive market is filled with food stalls with the wackiest delicacies. Try tako tamago – baby octopus with a stuffed quail egg head. Also check this comprehensive list of the best things to do in Kyoto. The area around Nishiki Market is the most convenient to get to the major attractions of Kyoto. You’ll also be in walking distance to hundreds of malls, bars, shops, and restaurants. If you seek a more unique experience amongst well-preserved architecture and century-old traditions, Arashiyama or Gion districts are better options. The first is a quieter area, closer to the forest. The second is the famous Geisha district. It’s not every day you get the chance to bump into an authentic geisha and her maiko on the way to your hotel. Check out this pre-filtered list of the highest-rated places to stay in the Gion district, Kyoto. Not only Kyoto is a massive urban area, but the main sights are all in different areas of the city, far away from each other. Keep in mind public transportation is optimized for local commutes, not for tourists. So there aren’t direct subway lines or easy transitions from Arashiyama to Fushimi Inari or to Kinkaku-ji. As a result and contrarily to other Japanese cities, buses will likely come into play. And a ride can easily take 40 minutes. My best tip is to not underestimate the time you take from A to B and avoid planning too many things for each day. Kyoto is definitely a place to study how to get around. Even in the most despicable of days, Japanese gardens still exude their magic. I knew beforehand that being in the impact area of an atomic bomb and that killed 200,000 people would be a powerful and moving experience. The iconic Genbaku Dome, the only structure left standing after the bombing, gave me a bit of chill. The Peace Memorial Park and Museum has loads of interesting and easy-to-digest information about the events that led to the bombing of both Hiroshima and Nagasaki, as well as effects of radiation in the population and environment. However, and maybe the gloomy rainy weather had a big part in it, but I’m sorry to say this was my least favorite place in Japan (not even having the best okonomiyaki saved it!). With all due respect to the tragic happenings back in Summer of 1945, Hiroshima is a stop-and-go place for me. Thing is I’ve made the (wrong) choice of staying in Hiroshima for the night. It helped the budget and is more convenient in terms of logistics. But quite frankly you’re better off spending time in Itsukushima, better known as Miyajima (see the next section!). Okonomiyaki is a type of Japanese savory pancake that can basically contain anything you like. I mean literally – the name means “cooked as you like it”. It usually contains shredded cabbage, eggs and a meat (pork or squid) and topped with several condiments and a special sauce. When you’re around in Hiroshima, try the local okonomiyaki recipe, which is layered rather than mixed and made with noodles (either yakisoba or udon). Sounds weird, but it’s delicious. It’s so popular that Hiroshima even has an okonomiyaki mall – Okonomimura – consisting of 3 floors of restaurants making this delicacy. Despite the subpar sunset, still a unique view. If there’s something I regret from my Japan trip is not staying overnight in Miyajima. Yes, it’s less convenient to carry your luggage or backpack there. Yes, it’s more expensive. But it’s entirely worth it to spend here at least 1 night. From the moment the ferry (one of the operators is included in JR pass btw) departs Miyajimaguchi towards Miyajima, you already have a glimpse of how amazing this island is. Mostly covered in forest, from the coast all the way up to the mountains with a giant orange torii gate just offshore. It’s a tropical paradise of its own kind: drenched in history and tradition of its shrines and pagodas. Once you get out of the station, cuteness overload. Hundreds of deer wander around the island; they’re kind, chilled and some can even come to greet (even though they have real intentions to steal with your food). Miyajima is a place I didn’t want to leave. You mean, apart from hanging out with deer? 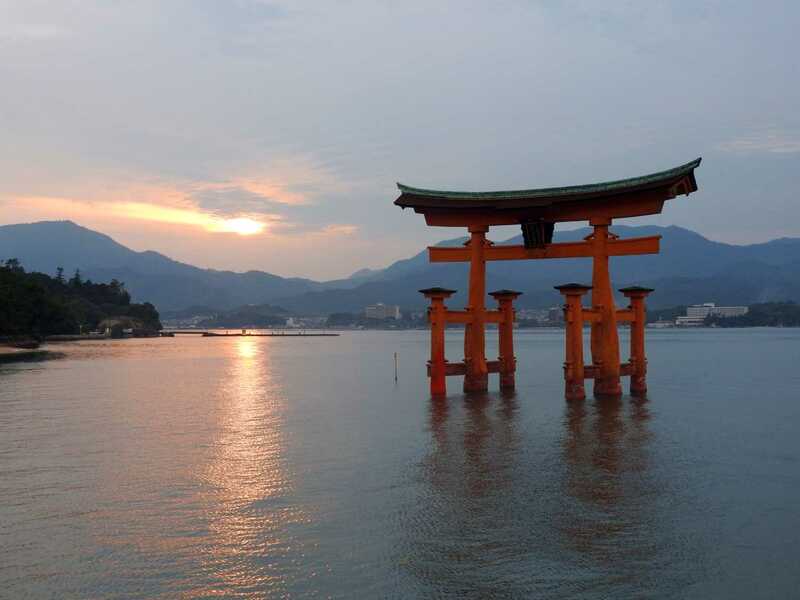 Well if you’re coming to Miyajima island, the floating Great Torii Gate is a mandatory stop. Check for tide schedule and come when the high tide submerges part of the structure and chill out at the nearby quay. Miyajima is also a perfect place to greet nature in hiking trails, with dense forests and great views over Hiroshima Bay. The restaurants on the island are not exactly cheap, but you can indulge in some unique food delicacies such as oysters and clams as big as your face. Seriously. Mount Misen – Hop on the Miyajima Ropeway (¥1800 round trip) to the top of this sacred mountain and take in the breathtaking views. Floating Torii Gate – One of the most beautiful sights in Japan. Check tides beforehand to get come here for sunset for the best photos. Itsukushima Shrine – Seaside 12th century shrine. Daishō-in – Another beautiful Japanese temple complex located in Mount Misen. On one hand, some of the largest Japanese temples and shrines can be found here. In between these amazing historical sites, thousands of deer roam freely, making it a magical and eerie site. You can buy cookies to feed the deer from street vendor stalls. Some of them can be a bit too eager (and aggressive?) but most are nice and will even BOW TO RECEIVE A COOKIE. How cute is that?! 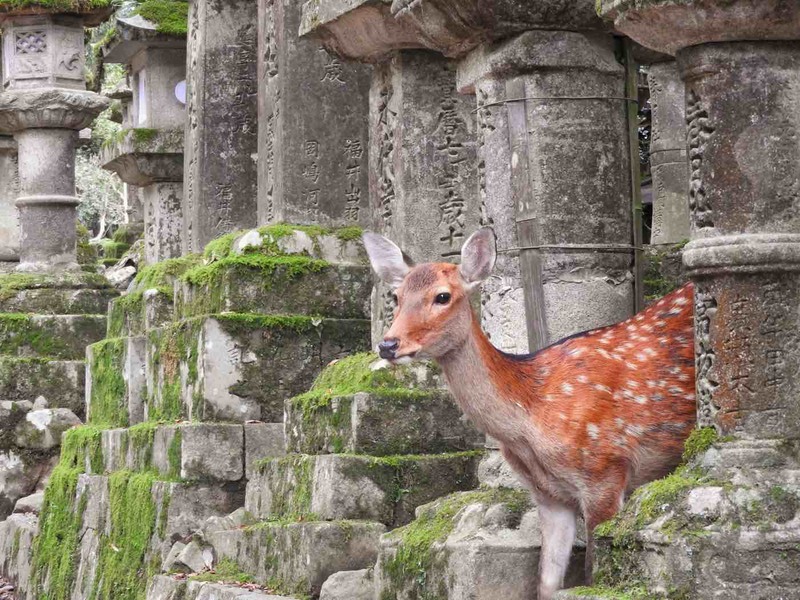 Nara is a fantastic day trip and one of my most memorable travel experiences ever. If you have some more time, stay in the area for a night or two to explore more temples and feed on its beautiful vibe. Tōdai-ji (¥600 entry fee) – enough to say this is the tallest wooden structure IN THE WORLD. Don’t miss the huge wooden guards at the entrance. Admission: 500¥. Horyu-ji – A little more sober but with an equally fascinating wooden architecture to admire. Admission: 1500¥. Kōfuku-ji – A Buddhist temple and also a UNESCO World Heritage Site and one of the Powerful Seven Temples. Admission: from 500¥. Osaka was my last stop in Japan and was the antipode of everywhere else I’ve been. People speak out loud on the trains. Everyone acts looser and more chilled (and they even queue on the right, not on the left like everywhere else 樂). Overall, Osaka is definitely more rough around the edges, but after weeks of the Japanese strict behavior, somehow this felt refreshing. Many choose to overlook Osaka on their trips to Japan, but honestly, I think you should give it a chance. At least for a night. Sure, Tokyo absolutely dwarfs it in size and there aren’t as many attractions, but the food scene is top-notch and it’s an opportunity to shed light on a different side of Japan. The beating heart of Osaka is definitely the Dotonbori area. It’s filled with party goers, extravagant neons, crazy arcades, and huge department stores. The river views from Ebisubashi Bridge are beautiful and just a bit surreal. The nearby iconic Glico running man just can’t be missed and is a popular meeting spot and tourist attraction. That said, what makes Dotonbori really special is the food opportunities. Osaka is absolutely obsessed with food and the thousands of restaurants, bars, and street vendor stalls here is a delicious mix. Don’t miss takoyaki, octopus dumplings served with bonito flakes on top! Since this was my last stop, I spent a considerable amount of time shopping for souvenirs and gifts back home. 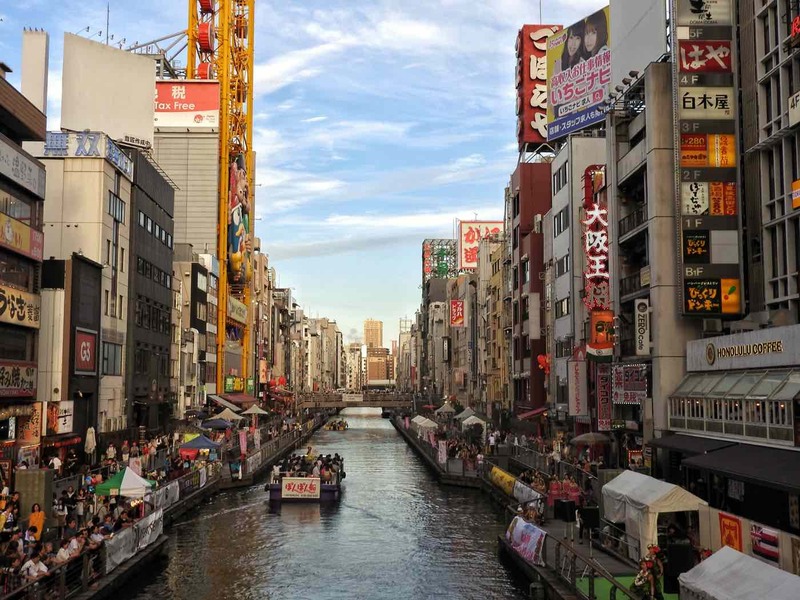 Dotonbori St – The more you go up the mountain, the less crowded it will be and the more special your experience. Glico Running Man – The icon of Osaka. Umeda Sky Building – Impressive views from the observatory on the top. Osaka Castle – A peek onto japanese castle architecture, although Himeji‘s is much more impressive. Himeji Castle – If you have extra time to spare, make use of your JR pass and take the train to Himeji to see a giant white castle worthy of your best dreams. There are 2 main “city centers” in Osaka – Umeda and Namba – which correspond to the main transport hubs. Namba is superior in nightlife and food, it’s bright, busy and loud unlike the rest of Japan. Umeda is more business-y, but with great food options too. It’s also close to some sights and it’s more strategic for shopping. Be careful though, I got lost twice on the HUGE underground malls! I stayed in Umeda, in Washington Hotel which caters to a more professional and high-end clientele. I’m not complaining though: had AMAZING views from my room on the 14th floor. Check out this pre-filtered list of the highest-rated places to stay in the Namba and Umeda areas in Osaka. Here is my cost breakdown, based on real numbers of my trip to Japan. Unless stated otherwise, prices in yen (JPY) and per person.  Accommodation: I stayed in a rather eclectic mix: a capsule hotel for 1 night, ryokan for 2 nights, guesthouses and business hotels. The average price of my accommodation for two people was roughly ¥10,000 per night. Because single rooms are usually not exactly half the price of doubles, I imagine per person, this would cost around ¥6,000 per night or a total of ¥84,000 for 14 full days.  Transportation: I bought the JR Rail pass that covered all the train rides throughout Japan + some urban journeys using the JR trains. The pass costed ¥46,000. Add an extra ¥7,000 for additional trips on other trains, subways and buses. 菱 Food: Especially in big cities, I easily got away with meals costing less than $20/person. Sometimes half of that. 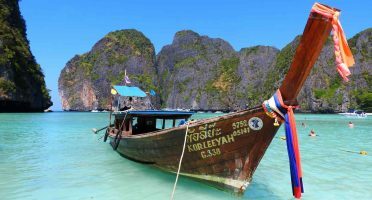 ¥6,000 per person per day, or ¥84,000 for 14 full days, will be more than enough for most travelers. ️ Others: Let’s add an extra ¥3,000 per day (¥42,000 in total) for entrance fees or other miscellaneous spending. If you’re a shopper, consider adding more.  Total cost: Altogether, you can expect a two-week Japan trip to cost around ¥263,000. Take these numbers just an estimation – speak to your accountant!  – and remember they don’t include flight costs. To be honest, I left this one behind because from what I’ve read online: Hot springs? Lush forests? Volcanic activity? Seemed similar to my home island, São Miguel in Azores. In any case, it’s a common travel getaway for locals and I definitely want to go there next time. They say the best views of Mount Fuji are here and this is enough of a reason to visit. Going just for a day is risky – check visibility forecasts to optimize your chances of seeing more than just fog. The northernmost island in Japan is a must go for me. Known for its ski areas, volcanoes, hot springs, and other beautiful forms of unspoiled nature. Who would have thought Japan is capable of doing tropical islands with white soft sandy beaches? On my bucket list and not only because I’m a beach bum. To add to the fascination factor, they’re one of 5 Blue Zones where people live the longest worldwide. I skipped this place on purpose because I want to visit it during the fall or cherry blossom season. A harmonious mix of lavishly-decorated temples and shrines, relaxing onsen (hot springs) and top-notch hiking opportunities around. 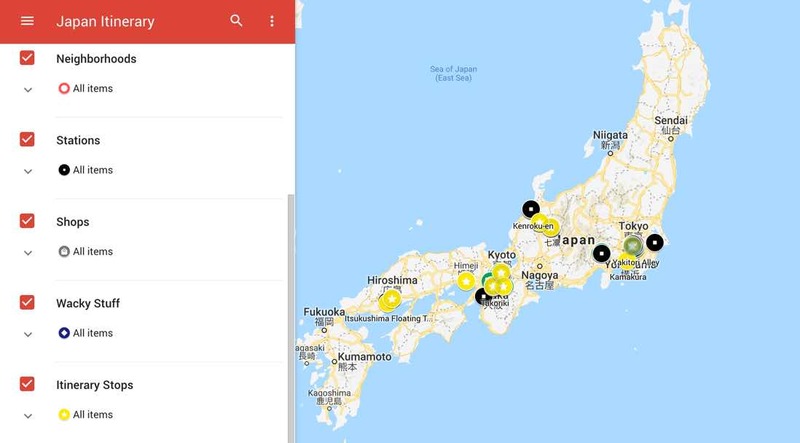 Are you planning your Japan itinerary too or have you been already? Which other places do you recommend adding to a first-time trip? Let me know in the comments below!